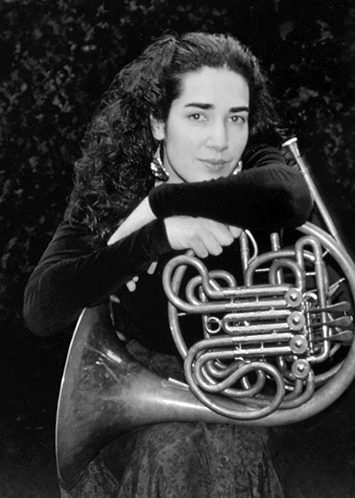 Carla Hallett, French horn player, composer, vocalist, and found sound instrumentalist, is a founding member of Canada’s Robert Minden Ensemble. The Ensemble was celebrated internationally, from the Lincoln Centre Institute for the Arts in Education (NYC), to the Kennedy Centre (Washington, D.C.), to the Music Centre of Los Angeles Education Division, and Sesame Street. Along the way, Hallett has introduced the French horn to thousands of young people throughout North America and the U.K. presenting the horn in unusual sound worlds of invented instruments, found sounds and musical stories. As a composer/recording artist, Hallett dedicates herself to the practice of collective composition. Her work can be heard on six albums (Otter Bay Productions), film scores, and on CBC and National Public Radio. Together with Robert Minden, composer/found sound instrumentalist, she formed a duo in 1997 to record and perform, exploring collective composition – the space between artists. Their latest album “What Is Your Name – songs from somewhere else” articulates some of the rich possibilities in this approach. Hallett grew up in Toronto and studied horn with Scott Wilson (Toronto Symphony Orchestra) then at the University of British Columbia with Eric Ralske (Vancouver Symphony Orchestra). She has been teaching French horn for over 20 years, and continues to be enlivened by the possibility of enabling others to produce its extraordinary sound.